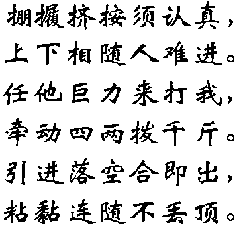 The Song of Push Hands (Da Shou Ge) is a Taiji Quan classic written in the form of a traditional style poem. Today there are two versions of Da Shou Ge. One version contains six sentences and the other contains four. practical insights for push hands training. an excellent Taiji Quan master. whichever direction he is heading, making it difficult for him to find an opening for attack. which is part of the Taiji principle). There is a practice routine for these four skills in every style of Taiji Quan. tactical skills, so here they stand for Taiji Quan skills in general. movements in general, regardless of direction. your movements. Do not overlook anything, not matter how small. Try to bring awareness to tiny details. miss his target. Do not let him feel your intention or give him any opportunity for attack. years before learning any other skill. According to the Daoist wuxing principle, when one stands stable and centered, one becomes like the earth. ounces force to move a thousand pounds. Taiji Quan skill seeks to accomplish. Lure him in to fall into emptiness1, then integrate and release your whole-body power (he) to throw him down. connection or no enough) or ding (resist directly against a force or too much). its target – your body, and meet emptiness instead, like falling into a trap, and causing him to lose his balance. Taiji Quan at its highest level seeks to have this effect everywhere. skills correctly and avoid the mistakes (i.e., diu and ding). falls under your control and follow you. be separated clearly, sometimes they occur simultaneously. are foundation of all other Taiji skills. principle, etc. So zhan is a skill people always use to gauge a person’s Taiji Quan skill. big problem for the opponent. contact with the opponent and waiting for an opening. your body to apply his force. two types of common mistakes to be avoided: diu and ding. in the body, it is diu. The concept of diu is also call bu ji – no enough, falling short, less than required. when you can do lian and sui well, can you do zhan and nian. Peng (ward off), lu (rollback), ji (push), and an (press) must be practiced seriously. To lure him in and fall onto emptiness, so no matter how he comes or what he uses. emptiness. Taiji Quan does not use force to against force directly no matter how strong you are. for attack. Use four ounces force to redirect and move eight thousand pounds1. have chance to use a small force to defeat a big force. It is true Taiji Quan skill. 1. The first sentence in both versions are exactly the same. 2. The second sentence of Version A and the third sentence of Version B are very similar. B. But Version A has more clear meaning. soft and following. In comparison, it does not connect very well with the preceding part. the most common mistakes of Taiji Quan practice: diu and ding. But these points are totally absent in Version B.
thousand pounds. They paint a clear picture of applied Taiji Quan skill.